Have you ever shared something on Facebook and received a completely different reaction when you shared that same idea or piece of content on Twitter, Google +, or YouTube? Recently, I shared a FAQ that I was particularly interested in, talking about what the loss of keyword data means for websites. Unfortunately, I did not consider whom I was sharing that content with and received a less than friendly reaction, as you can see. 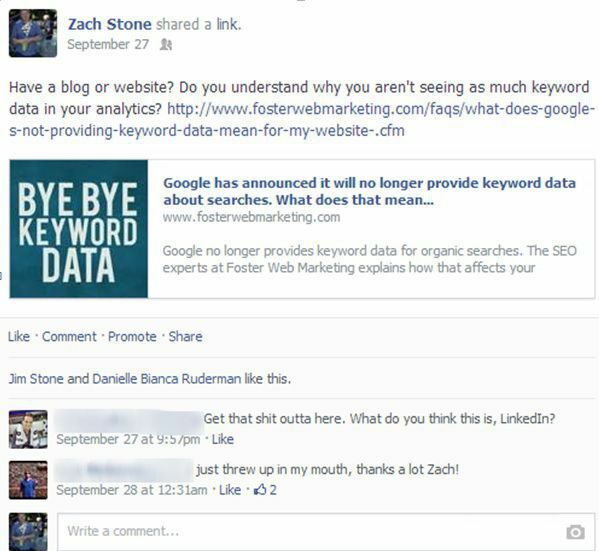 My friends on Facebook obviously did not care that keyword data for websites is disappearing. Luckily, my Dad and Danielle Ruderman gave me some sympathy likes. I did not consider that my friends are not interested in website analytics and the ever-changing SEO industry. It was just not the right place to share this type of content. You may be wondering how I know that the problem wasn’t due to below-par content. Well, Foster Web Marketing shared that same FAQ and it had the sixth highest number of visits from social media in the month of September, with quality user engagement. I also shared the same piece of content on Twitter, where I have more online SEO professionals following me—it saw much better interaction there. Getting people to view your content through social media is great, but do they like what they see? Take a look at your user engagement and compare your different social media referrals. Look at the average time on site, page views, and bounce rate to see if the audiences from different social circles actually interact with your website differently. Listen to your audience and pay attention to how they are sharing your content. Keep your message simple and easily understood. Check to see if your social circles prefer different days of the week for your sharing by looking at a much longer time period in your analytical data. This can be difficult because there are literally hundreds of opinions out there regarding the best day of the week to share on social media. In addition, it can be different for every social audience, industry, or type of content. Look at your own data and see if there are any patterns. Much like the news cycle, if you post on a Sunday afternoon or on Friday after 4:00 p.m., you may as well post on MySpace; no one will see it. Are there certain types of content that your audience prefers? Use advanced filters to look for content themes for landing pages. If you have a large firm, you may dabble in many different practice areas. However, is everyone in your social circle interested in all of them? It could be that everyone who follows you on Twitter is interested in workers’ compensation information and everyone on Facebook prefers to learn about estate planning. Simply put, know your audience. Every social platform is different and attracts a different group of people. For example, Twitter is used to discuss products, services, and reviews, while Facebook is a digest of information. Along those same lines, are visitors to your site more interested in news, blog items, articles, or FAQs? Use advanced filters to determine if visitors are interacting with one type of content more than the others. Use the visitor flow section to determine where your visitors go after they arrive at your site through social media. Do they immediately try and contact you? Are they reading more information about a specific topic? Do they go to your testimonial section to see what people are saying about you and your business? Ideally, they would contact you right away. However, if they are not going where you expect or want them to go, you may want to rethink the topics you are sharing. Please do not get caught up in thinking that social media will be a contact driver, though. Most companies understand that it is nearly impossible to track ROI for social media. Instead, it is important for brand awareness, audience building, and customer relations. Size Matters. Anything over 140-180 characters is too much for your audience to take in. Keep your posts short and concise. The longer your post, the greater chance you will be scrolled over and lost in the shuffle of other updates and tweets. Think twice, post once. Being in the social space and sharing information is fun and exciting, but exercise caution when sharing. Be sure to share things that are relevant and couth. If your grandmother would not share the information, picture, or meme in church, you should not share it on your social page. This May Seem Like a Lot of Information, but We Can Help! You already knew why social media is so important for your law firm’s websites, but I hope we have provided you with some good ways to dig down into your data to make sure your social media campaigns are performing their best. As social interactions become increasingly more important for SEO and Google’s Hummingbird Algorithm, you do not want to ignore this important part of your online marketing strategy. However, I understand that you may not be interested in digging down into this type of data to help improve your social media efforts, and I don’t blame you. Sometimes, I get lost in the data too. At Foster Web Marketing, we provide high-quality social media campaigns for our clients. If you need help, we have you covered!